I tend to start my blog posts with a didactic statement about film, something I’ve learned about film that I want to illustrate with a particular movie, but this post will be different. This is likely going to come off as pretentious, but perhaps at the end you’ll understand why. This is the film. I’ve read thousands of blog posts and critical reviews of movies over the years, some of them containing stories with accounts of the writer being rendered speechless or unable to move when the credits roll. I’ve read columns where the critic was emotionally shattered by the end of the film, that their nerves were frayed and their minds saturated as they wandered out of the dark theater. Call it my overly-cynical nature, but I always thought that kind of talk was hyperbole, that it came from the mouths of people who forget that they’re watching a movie, that they were somehow too stupid or emotionally frail to separate themselves from a fictional narrative. I get it now. For me, I say again, this is that movie. The best stories are able to manipulate your mind, your feelings, and emotions in a way that makes you feel the movie as much as see it. The different artistic mediums accomplish this in different ways. Film’s strength lies in the juxtaposition of sound and imagery, but very few films accomplish the feat of combining the two in such a way that it feels, to use a common term of hyperbole, perfect. 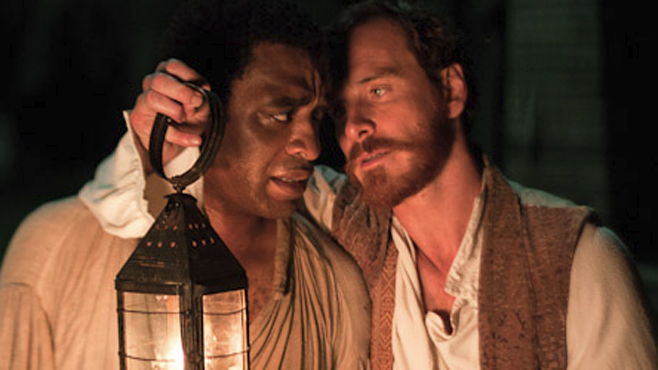 To me, 12 Years a Slave is perfect. The compositions within and between scenes, the slow, steady camera, the sparse yet useful dialogue, and the mix of subdued and volcanic performances all blend perfectly to make a film that transcends the medium. I understand this movie will not feel that way for everyone, and I would never expect it to, but for what I look for in movies (read my thoughts on that here) this film hits every single note. This film is not Django Unchained, though it’s funny to note that director Steve McQueen has his main character referred to as an “exceptional n****r” multiple times in the film, same as Tarantino’s spaghetti western. In my mind I’d like to imagine McQueen using that same terminology as a wink to QT saying, “You think Django was exceptional? Meet Solomon Northup”. And exceptional he is. The tale is a true account of a free Black man who was kidnapped from his family and comfortable New York life and sold into slavery. In my opinion the best stories can be summed up in such simple terms: (blank) happens and we watch them live in these circumstances. There are no expected beats in this film because it is not hindered by convention. It’s raw, it’s in your face and it is captivating. Having McQueen at the helm of this story is the ideal marriage of material and director. He is one of the few people working in film who can combine story and visuals in such a masterful way; a true artist. I seriously could not spot a single camera move or moment in this film that isn’t perfectly placed, timed, and executed. Make no mistake, the way you feel and the way you think during this film are all engineered by McQueen. His use of color, light, shadow, long-takes, and shot composition are astonishingly brilliant (have I broken the hyperbole scale yet?) and are used to such an effect that it creates a world of the film that envelopes you. I honestly had intentions of writing lots more about this film, and maybe I will in the coming days once I sort it all out. Just know that this film needs to be seen, nay experienced, for any film that reduces a grown, 32-year-old man to a speechless ball of tears is something more than just a movie.